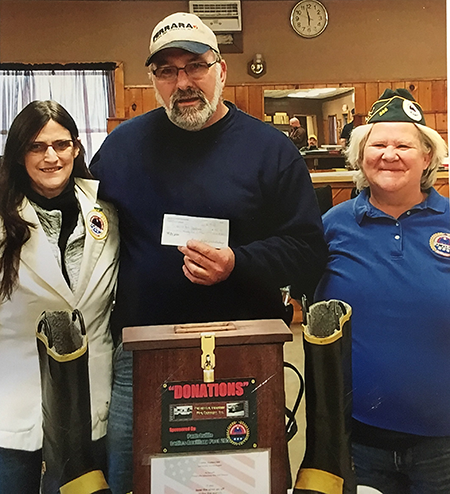 PARISHVILLE – The Parishville Amvets Ladies Auxiliary held a boot drive this past spring to help raise money for the fire department. The ladies placed a donation box at the Amvets Post bar and anytime the fire whistle at the station across the road sounded, those at the post could donate into the box. The group collected $425 which was donated to the fire department. Above, Mary Gilbert, Amvets Auxiliary third vice chairwoman; Fire Chief Edwin Cool; with Auxiliary member Rose Bump were on hand for the donation.